William Duvall, lead singer of Alice in Chains, approached Oniracom for a custom blog site to host his personal thoughts and day-to-day happenings. We skinned his Tumblr blog with a custom background image, social navigation, and a Topspin widget in the header of the page. Our design compliments the intuitive functionality built into Tumblr, and this option eliminates any needs to learn a content management system. We also created and branded William’s social networks as a foundation for his future brand health. 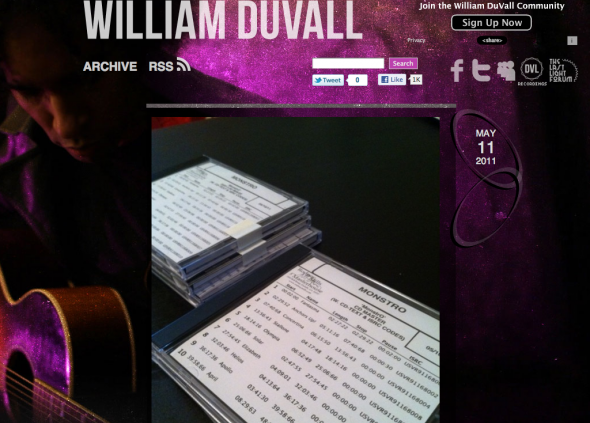 Visit WilliamDuvall.com to see this project in action! I’m diggin’ on this blog, Copy Cat, where people can upload covers of songs. Not only can you find your favorite songs covered but you can also find some of your favorite artists taking a stab at other peoples songs. So far we like Beck covering The Flaming Lips, Norah Jones covering Wilco, Elliot Smith covering The Beatles and Oniracom’s client Zee Avi of Brushfire Records covering Interpol. You can check them out at copycats.tumblr.com or have your covers delivered right to your door step by following them on Twitter.